Hey folks! Just thought I’d let you know I’ve set up a Patreon campaign for my various comics. If you’ve been enjoying Sloths and Trolleys, Jenny Music, or any of the other stuff I’ve been making then please consider supporting them by becoming a patron. Even just a small pledge makes a difference! 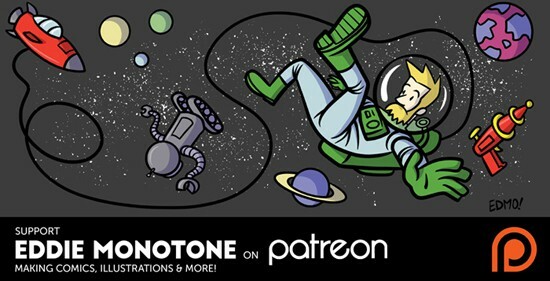 You can also get early access to new strips, Patreon-exclusive sketches, and possibly even a say in which projects I work on in the future. And as an extra bonus – the first ten patrons will go into a draw to receive a unique one-off illustration as a hi-res PDF (The winner will be selected at random once ten people sign up, so get in quick if you want to win). This entry was posted on 03/08/2015 by Eddie.